The contemporary has a way of creeping into even even the most scrupulous attempts to re-create the past, be it through a too-modern turn of phrase or an overlooked anachronism. So maybe it’s better to not even try. That’s the apparent attitude of Richard Donner’s 1985 fantasy Ladyhawke, whose premise could have been borrowed from a medieval romance and whose attitude and every other element belongs squarely to the 20th century. Set in an underpopulated section of early medieval France, the film stars Matthew Broderick as Mouse, a quick-fingered thief whose neatly clipped hair is just the first indication that no one involved cared all that much about transporting audiences to another time and place. Broderick was a year away from Ferris Bueller’s Day Off, but his character’s habit of talking to himself in wisecracking asides, though not directly to the camera, occasionally suggests he’s playing a long-ago ancestor of the John Hughes’ hero. Life moves pretty fast for Mouse, too. As the film opens, he’s just escaped from certain death in the prisons of the evil Bishop Of Aquila (John Wood), who rules the land with the help of a bunch of pitiless soldiers. An angry man determined not to let even a mere thief escape his iron grasp, the bishop sends his men to retrieve Mouse, who’s then rescued by the terse, noble Etienne (Rutger Hauer), a former captain in the bishop’s army who’s since gone rogue. He has good reason, too: When the bishop learned that Etienne had won the heart of Isabeau (Michelle Pfeiffer), the woman they both loved, he called upon satanic forces and laid a hideous curse on the couple. By day, Isabeau was forced to assume the form of a hawk. By night, Etienne similarly became a wolf. Though companions to each other in their animal forms—she aids him as a hawk and he protects her as a wolf—they could never be together as humans. Unless, of course, they’re helped by the assistance of an intrepid young thief and a kindhearted priest (Leo McKern) who knows a way to cheat the curse. Working from a script by Edward Khmara, Michael Thomas, and Tom Mankiewicz (with uncredited contributions from David Webb Peoples), Donner moves the film at an unhurried pace. The action scenes, for which Broderick and Hauer seem to have done quite a few of their own stunts, are fun, if not especially ambitious, and spaced out between long stretches of Mouse and Etienne traveling the countryside. But, oh, what countryside! Shot by Vittorio Storaro, working largely in northern Italy, Ladyhawke seems almost designed to take up a full day of the @OnePerfectShot feed. The forests have the same creeping mist Storaro brought to The Conformist. The sky glows in illustrations of magic hour that would make Days Of Heaven envious. Storaro heightens color in ways that don’t even seem possible in the pre-digital era. It’s almost too beautiful for the movie it’s serving, a likable-enough adventure that feels much smaller than the widescreen landscapes in which it takes place. 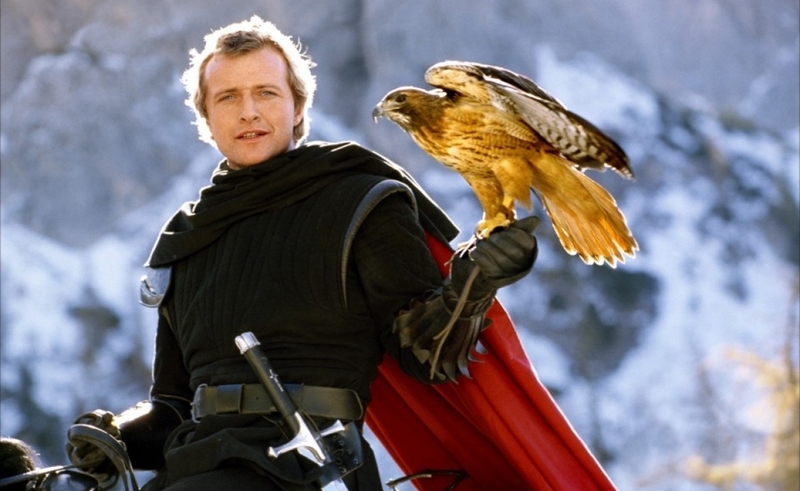 Ladyhawke doesn’t really do enough with Hauer or Pfeiffer, and does a bit too much with Broderick, who’s charming but whose character never stops resembling an ’80s teen who’s been transported back in time. (Perhaps via a DeLorean or a phone booth?) It doesn’t help that the script keeps coughing up laughable dialogue (“I believe in miracles,” the bishop tells a henchman. “It’s part of my job.”) or the inclusion of an awful guitar-and-synths score produced by Alan Parsons and written by longtime Parsons associate Andrew Powell. Then again, changing any of those elements would make Ladyhawke something other than the unabashedly cheesy fantasy it seems content to be, and it’s just that quality that makes it such a pleasurably undemanding watch. None, but this Warner Archive Blu-ray edition highlights Storaro’s cinematography like no previous incarnation of the film.